For the living, their houses are shelled, they can't find food, they don’t have a job. All they can do is throw up their hands in exasperation. They don’t like the regime, but it's impossible for them to live under these circumstances. They are the innocent people, stuck in the middle, who will have to live with the consequences. And often they'll be the ones paying the highest price - with their lives. As these residents struggle to survive, living in the middle of a war zone, a tension is beginning to grow between local residents and fighters who have come in to use towns as bases to fight against government forces. Many of the major deciders of what will happen to Syria in the coming weeks, months and days are not from Aleppo, but they are based here now. They've descended upon the town, home to 2 million, with residents having little say in the matter. Outside a rebel command post, we hear a loud argument break out between between jihadi rebels and local pious Muslims wearing skullcaps. It's not clear what they were fighting about, but it is clear the tension is continuing to mount between the fighters and the locals. In one neighborhood we see a man, his wife and their son carrying bags. We ask them why they were leaving. The father says they needed a change of atmosphere. That, certainly, is an understatement. His wife, wearing a black veil, says she just wants the rebels and the Free Syrian Army to leave. They just want to be left alone. They merely want to live in their home in peace. But they have no choice and are forced to flee. With many of the rebels being jihadis, locals express their concerns. Since I've been in Aleppo, I've never heard the word democracy used once. They may use the word freedom, but the debate over what that means couldn't be more different depending on who you talk to. Many of the rebels say they want to see Islamic law be the rule of the land. And many locals in Aleppo, though they are traditionally Sunni and religious, are concerned about the power that jihadis with guns who want Islamic law are gaining. But those concerns are just the start. Later, as we dine in the home of a man outside of Aleppo, it becomes clear that frustrations are mounting about how success can be achieved in Syria and what that even means. "The problem with this revolution is that we don’t have a leader," the man tells me. "It would be good if we had five leaders, but we have 500 leaders. And that’s what worries me." With rebels being divided into local units, jihadi units and additionally the Free Syrian Army, the sense in many parts of town is one of pure chaos and concern. Who is in charge? What is the plan? Is there one? We saw one man trying to buy an AK-47. But he had no plans to fight against the government. For him, the real danger was still to come. He told us he wanted the gun to protect himself from looters and thieves and out of fear of what may happen if the regime falls. Nobody here knows what will come of Syria if al-Assad's regime does fall. And for some, that's the scariest part. – Life and death in Aleppo: He wasn't a fighter or a revolutionary. But 45-year-old Hassan, a shopkeeper, died from a sniper's bullet. 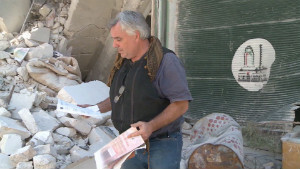 – How to sneak into a war zone: To get in and out of Aleppo, it helps to have a Plan B. And maybe a Plan C and D.
Ok, this is probably not put online but anyway... Since it is well known that Ben is into linguistics, I just want to correct him: niẓām, according to Wehr, has more than two meanings of which none of it means "regime". Its meanings, depending on context, are "proper arrangement, regularity", "conformity, congruity", "methodical, organic structure", "organization", "order", "method", "system", "rule, statute, law", "system of regulations". Its adjective niẓāmī means "orderly, regular, normal", "methodical, systematic", "regular (army)". However I admire Ben's expertise and I hope, God willing, he and his crew stay safe. All the best to him, his team and the fixers. is incredibly naive and I am being kind with that statement. I believe the latest bombing of that otherwise safe city was the direct effect of the Journalist being there. Assad doesn't want the stuff he's doing reported on. So wherever the news team goes he'll bomb. After awhile nobdy will want Journalist near their city. I heard the people of the town after it was bombed went after the news team and they had to hightail it outta there. It is very sad to see the destruction of syrian towns and cities by the little Hitler who's brain is fragmented with many schizoprenic and paranoid ideation. It is also amazing that those who support Assad are still commenting on many CNN posts. Most of them are Alawite and few are confused christians who cannot see right from wrong. How could any one support the killer of chilren and women. How could any person in his right mind bomb his country like that. The whole world is perplexed by Assad and His Alawite sect. Definately those bastered are out of their mind and digging their own grave. Alawite sect has lost syria for ever. Assad is a little Hitler, his mind is a mind of paranoid schizophrenic sick individual. Can you imagine this mad man is rulling syria and his stupid Alawite sect is supporting him to his end. DIGGING THEIR OWN GRAVE. NO FUTURE FOR THEM . They have lost the trust of the whole world except China , Russia and Iran who have the same oppressive mentality. Those country will give you refuge when time to come. well, wouldnt you support someone who you beleived in and had full faith in?! those countries will support when the time comes? you my friend obviously have no knowledge of middle easter mentality... or else you would know that we take help from no one! Its not a matter of religion!!!! Religion has nothing to do with it people! OH My! If you all only knew what real suffering is ahead for this world! The message has been around for a very long time, and yet, still is not believed..People don't want to know truth, so they just keep killing and blaming..BTW..the only thing human nature has control over is stupidity and a very bad nature..and they refuse the cure..Have fun with that.shesh! As if God really wanted this for His creations! He didn't! But have it your way.AND, when He allows men their freedom of choice and Will, that is not good either! And you ask WHY bad things happen! Oy! Oh! The physical world was not meant to be forever..so ya'll might want to start getting used to that reality..and be a bit more concerned about what comes after..What will you do when you find that there is indeed an eternal Spiritual realm? Sorry won't cover you then! Too late! If your sad and crying over the loss of life now,as well we all should be, this is nothing compared to what is on the way! Because the world has gone against the Creator! That is WHY the world is in this condition..And those who do claim God have also pretty much laughed in His face! Good goin folks! Stop complaining and blaming..The entire anti God world is to blame for the conditions..Not to mention all those who claim God and still act like morons! Wake up! Get ready for some real war! Its coming! Read the Book! One more thought..don't go purchasing an underground dwelling..lol Nor believe anyone who says they know when this war of the ages will come..That is a lie! Just know it is, and your physical life will end and all men will be judged..even me! Oh Boy! Yikes! Get them out of there!! Why does cnn never point out that the gov't has to attack civilian areas because that is where the rebels hide. If the rebels left thoe ares, the gov't would not have to attack them and could go after the rebels directly.